With New York City’s real estate boom, few parcels of land have been overlooked. 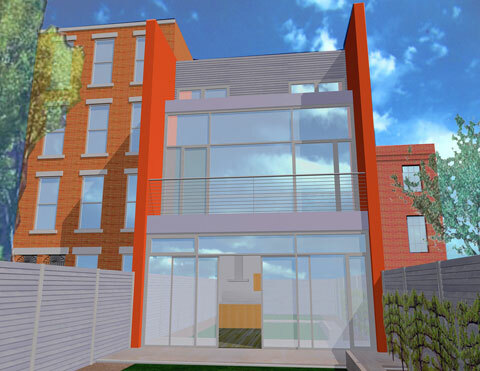 Even the city’s tiny infill lots have become hot propertyyand the perfect sites for reinvigorating the town house type. According to architect and town house expert Alexander Gorlin, these narrow and long residences are the building blocks of the city. The dense residential urban fabric of Manhattan and Brooklyn was historically defined as much by the blocks of town houses as by the voids between themmthe unbuilt lots that until very recently were a prominent part of the streetscape. Their constricted sites have long made town houses an absurd economic proposition. Multifamily residences have obvious economies of scale and higher returns. Moreover, building a town house has its unique problems in New York: With no staging area for contractors and the need for expensive underpinning of the neighbor’s foundations, prices can range from $500 to $1,500 per square foot. But the phenomenal rise of real estate prices and ability to flip even small properties (this, the town of million-dollar studios), it has become economically feasible to build on these empty parcels. With the city’s small infill lots being snapped up at unparalleled pace, the experience of walking in the city has been forever changed in a relatively short period of time. The town house as a building type in fact reaches back to Crete and Pompeii, a city built almost entirely of these narrow-fronted single-family structures. Le Corbusier describes them in great detail in his 1923 Towards a New Architecture. He admired them for the great variety of space and light they allowed within a standardized plan, which fit in with his theories about the potential industrialization of housing, and the relationship of the part to the whole in the house and the city. Leon Battista Alberti and Andrea Palladio also wrote at length about town houses, and in his 1516 socialist tract Utopia, Renaissance scholar Sir Thomas Moore described his ideal city Amaurote as composed of town houses: The houses be of fair and gorgeous building, and on the street side they stand joined together in a long row through the whole street without any partition or separation..
As a former Dutch colony, New York City inherited the town house type originally from Amsterdam, though the local variations derive equally from London precedents. The stoop is of Dutch origin, while the common half-level dropped floor is drawn from the London type. These references persisteddperhaps too persistently. From the massive construction of brownstones and classical townhouses in New York in the late 19th and early 20th century, one can count one hand the number of modernist takes on the town house. There’s the glass block front of the Lescaze House of 1937 on the Upper East Side; the lacy stone faaade of Edward Durrell Stone’s own uptown house; George Nelson’s streamlined Fairchild House of 1941 at 17 East 65th Street; Philip Johnson’s Miesian Rockefeller Guest House of 1950, in Midtown; and Morris Lapidus’ home and office at 256 East 29th Street, of 1950. The great breakthrough in modern town houses in New York are the ones by Paul Rudolph, primarily his own mirrored extravaganza, designed in 1972, overlooking the East River. All these houses owe a great debt not only to the modern movement but to a number of houses that areebut almost never referred to asstown houses. Sir John Soane’s own London town houseeactually three linked houses, built from 1792 to 18122is one of the best examples. On the exterior it is stately and reticent; inside the house is an archeology of the architect’s mind, exploring the house as the site of life and death with a sarcophagus and dome of heaven above. 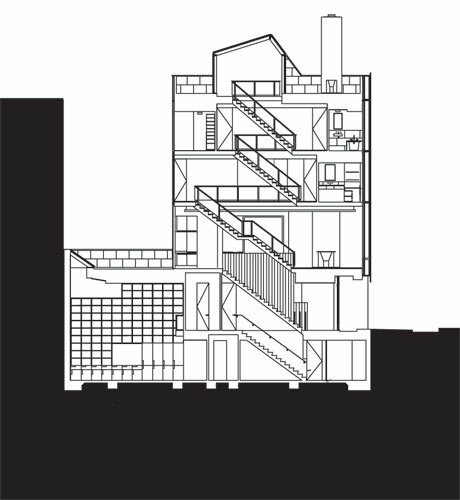 His architectural innovations have inspired Philip Johnson and others for their insight into the town house typology. Le Corbusier’s series of town houses of the 1920ssthe Ozenfant House and Studio (Paris, 1922), Maisons Guiette (Anvers, 1926), Maison M. Cook (Boulogne-sur-Seine, 1926), and Maison Plainex (Paris, 1927))are also very important. Despite his loathing for the street and urban life in general, Le Corbusier designed these town houses as respectful neighbors of the urban street wall. On the interiors, however, all hell breaks loose, following the French tradition of the asymmetrical planning of the hotel particulier. The masterpiece of the modern town house is without a doubt the Maison de Verre, designed by Pierre Chareau and Bernard Bijvoet in 1931 for the French gynecologist Dr. Dalsace. It is an obsessive exploration of the relationship between technology and the sensual domestic interior. Its striking translucent glass block facade provides privacy and recalls Adolf Loos’ dictum that a cultivated man does not look out the window… It is only there to let light in, not let the gaze pass through.. On the interior, industrial details of structural steel bolted columns are surrounded by articulated wood cabinets framed by wrought iron and steel on a rubber tile floor. Its unlikely juxtapositions of materials has provided a model for the town house interior for over 75 years. Loos himself designed numerous town houses that explored his Viennese contemporary Sigmund Freud’s idea about the psyche, that the dream has a faaade like a house.. 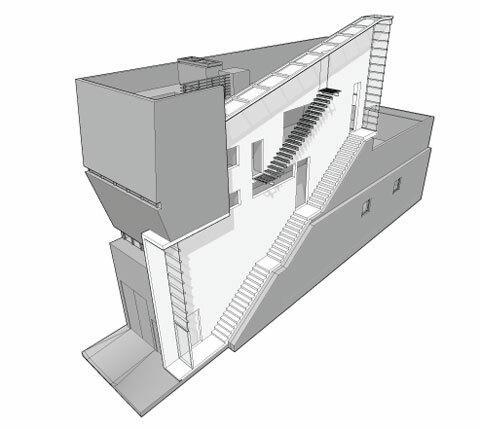 The Tristan Tzara House in Paris of 1926 contrasts a symmetrical faaade with a labyrinthine interior of stairs, different levels, volumes and materials. Even the Schroeder House by Gerrit Reitveld in Utrecht of 1923, one of the seminal houses of the 20th century, is really a town house. At the end of a block of traditional Dutch houses, it takes the same rhythmic dimensions and explodes into a series of planes, De Stijl primary colors, and interior sliding panelsscontaining lessons that have been rediscovered time and again by contemporary architects. 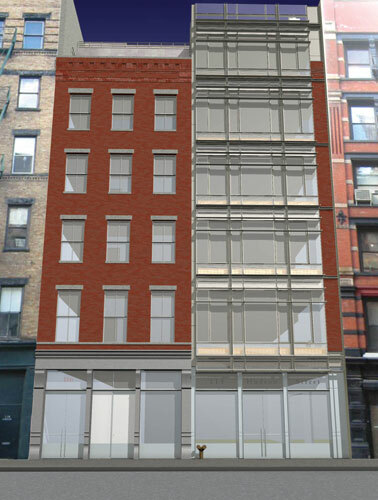 The New York town houses depicted here show the latest exploration of the ancient building type that is at once inflexible in its constricted frame, generous with opportunities in section, street expression, and circulation, and rich with challenges in lighting, budget, and construction. Alexander Gorlin, FAIA, is the principal of Alexander Gorlin Architects. He is the author of Creating the New American Town House (Rizzoli, 2005). 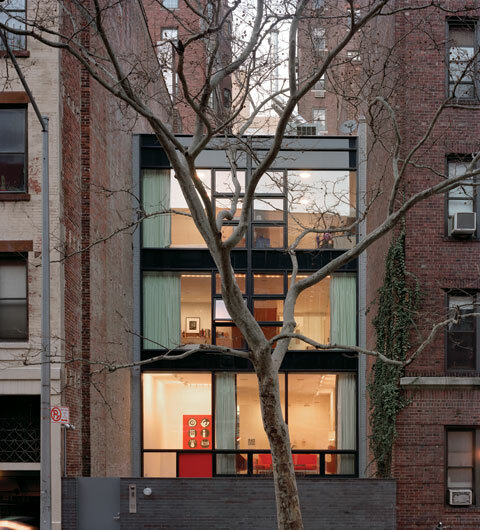 Unlike other urban infill projects that build to the lot line, this jewel-box of a house, which occupies a 25-by-100-foot lot on the Upper East Side, is set back 25 feet from the street. It actually occupies the footprint of a previous structure, a 1958 two-story modernist town house to which architect Alexander Gorlin wanted to pay respect. He also preserved the glazing and mullion rhythm of the original ground-floor faaade, extending them upward, to the renovated second floor and a newly added third floor. In the original house""sandwiched by two big apartment buildingss?it got darker as you went up,, said Gorlin. He made the quite natural decision to glaze both front and rear elevations, and also funneled light through the home via a skylight-topped open staircase. Further, he floored the hallway of the top level with glass blocks, which allow light to penetrate below. Gorlin converted the basement into a children’s playroom, reserving the entrance level for spaces for entertaininggkitchen, dining, and living room. 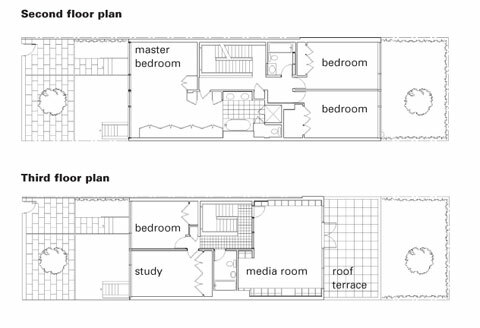 Private bedrooms fill the second floor and the top floor contains a guest room, office, and an acoustically isolated media room that opens to a terrace. The husband is in the music business so the media room is the ultimate space in the house,, explained Gorlin. The clients of this ground-up infill house wanted a suburban house in an urban setting,, said New York architect Tina Manis. They wanted a garage and a big backyard. 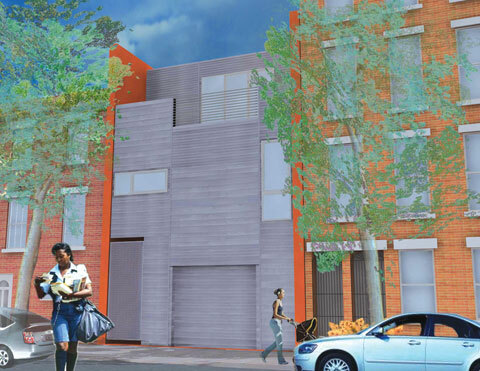 But they also wanted a rental unit and separate entrances. The challenge for Manis, formerly a project manager at OMA who broke off on her own five years ago, was to design a structure that allowed all the home’s future inhabitants to have open views and space as well as privacy. The first two floors are the owners’ unit, with a second-floor terrace that overlooks their backyard. The rental unit has its own street entrance, leading to the top floor and a terrace facing the street. Basically, they want the rental to be invisible,, said Manis. In suburban style, the faaade is wood-sided, though in this case, the elegant cedar-birch panels are arranged in alternating widths and patterns, forming a moirr pattern. The different textures create a screen (left, top) that cleverly hides the owner’s entrance, the garage door, and the tenant’s entrance. The project features an all-glass back faaade (left, below) that opens to their backyard. 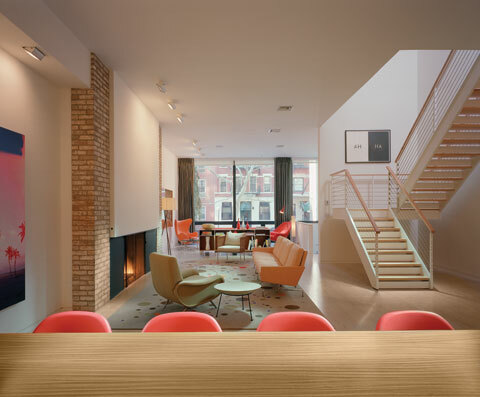 In addition to being architect Matthew Baird’s first ground-up building, this 5,000-square-feet West Village town house also has the distinction of being the first single-family home built in the district in the last 14 years. 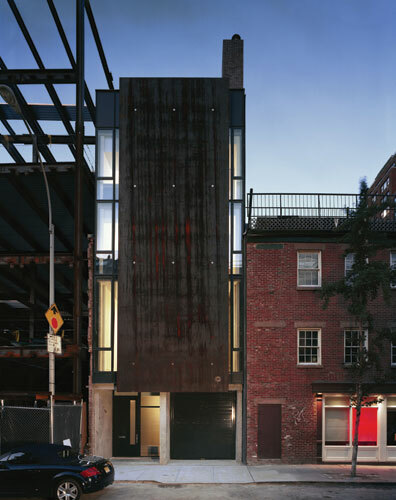 A former architect at Tod Williams Billie Tsien Associates, Baird used a single, prefabricated 40-foot-tall steel plate to create a sense of privacy within the buildingga feature not unlike the massive metal-alloy faaade employed at Williams and Tsien’s Museum of American Folk Art. Inside, the house, which sits on a 20-by-60-foot lot, features such striking spaces as terrace and kitchen that are completely open to each other, a double-height media room, and plenty of skylights. 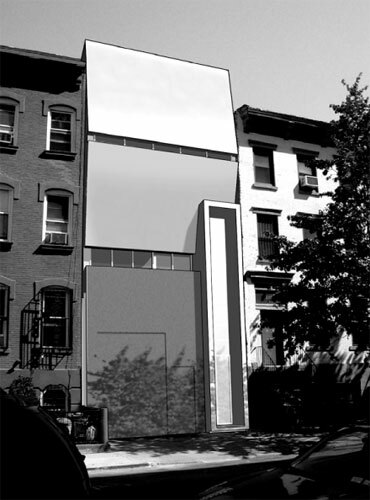 The project is both forcefully modern and context-appropriate, in scale and even material (Baird argues that the house’s industrial feel relates to the surrounding Meatpacking District), despite neighbors’ initial disapproval of the project. This 19,000-square-foot residential conversion includes an existing five-story 19th- century commercial loft building and an adjacent narrow, vacant 1,615-square-foot lot. We wanted to acknowledge the recent history of the site in our design,, noted George Scheiferdecker, a principal of BKSK Architects. Having something transparent is a reminder of that long-standing gap in the city fabric.. The infill structure has a glass and aluminum faaade. Due to current zoning laws, it is only 45 feet deeppmuch shallower than the adjacent building to which has been attached. 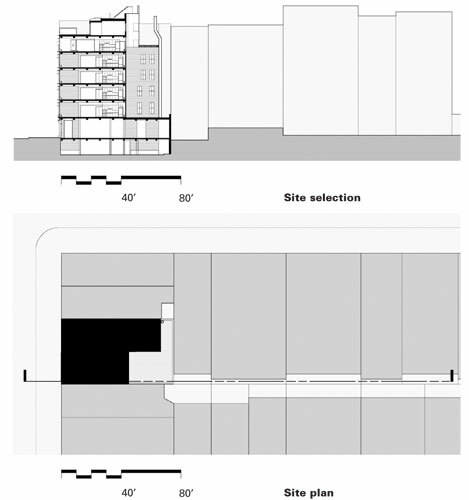 With the street appearance of two separate buildings, in fact, the new structure is united, with individual apartments occupying full floors. 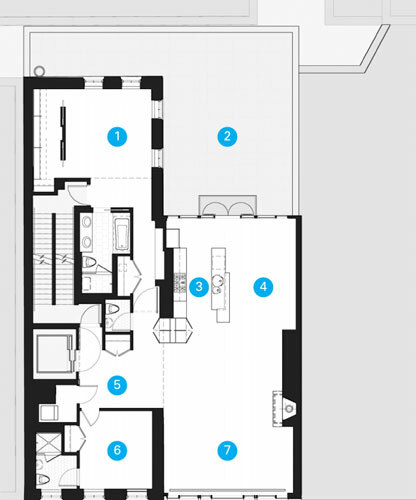 The new, glazed half is open in plan, housing the kitchen, dining, and living room spaces. 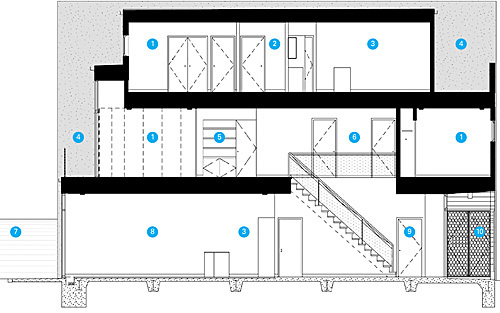 Bathrooms, bedrooms, and storage spaces are housed in the more closed existing structure. The new, enlarged ground-floor is now available for lease to one or two commercial tenants while a two-story penthouse was added to the twin structures. This three-story apartment and studio for the artist Tara Donovan is a two-level addition to a one-story garage on Williamsburg’s south side. For all intents and purposes, it is a new building. 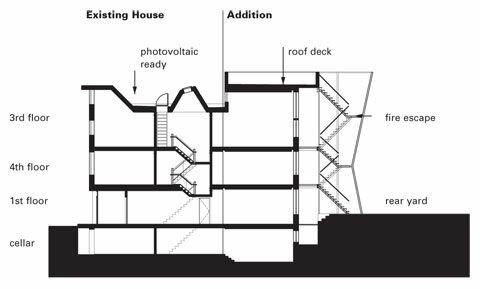 Standard Architects developed a scheme in which three very distinct spacessa ground-floor working studio and garage, and second-floor private studio, and a third floor apartmenttare linked by dramatic, skylight-lit stair that runs up diagonally along the side of the three spaces. We had to sacrifice a little bit of floor space, but Tara was really enthusiastic about the idea of the single stair,, explained principal John Conaty. The new building is in scale with its neighborhood, but unlike the tenements nearby, is oriented almost entirely toward the rear of its 18-by-100-foot lot, which overlooks a park with mature trees. The street faaade is divided into three distinct elements: Corten steel clads the ground level, while two tilting planes of concrete shield the upper two floors from view. A glazed strip demarcates the division between the floors. 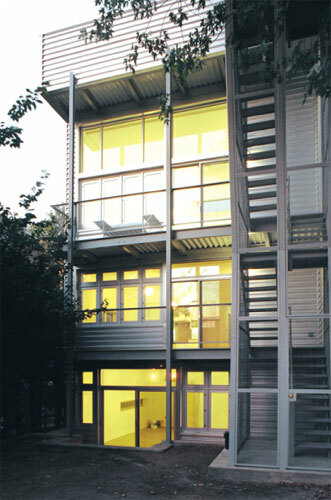 In contrast, the rear of the building is almost entirely glazed, and a top-level roof deck is visually connected to the park below by a second-story terrace. What began for New Yorkkbased Coggan + Crawford as a renovation/addition to an aluminum-sided three-story walk-up turned into a total overhaul. The mid-century building needed so much structural reinforcement that, at a certain point, the architects found themselves faced with gutted and stripped remains. We started with the concept of marrying old and new and we and we wanted to stay with that,, said principal Caleb Crawford, even though the whole new building is basically new.. 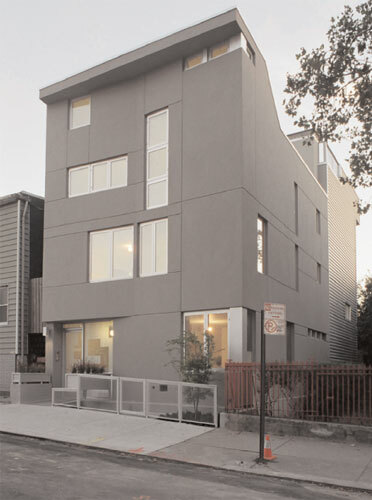 The buildinggnow home to three full-floor apartmentssis clad in stucco in front, presenting a simple face to the street, while halfway back the skin changes to corrugated metal. Front windows are smaller and irregular, while those on the south-facing rear are expansive, to allow for added light throughout the building. The architects sited a skylight-lit stairwell, which leads to the front door of each flat, at the center of the building, to divide the long, narrow spaces. 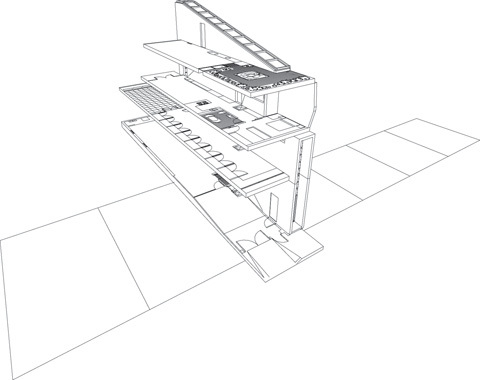 The rear elevation features an attached fire escape, which links to each floor as well as a roof garden. Crawford had planned for a green roof and solar panels, both of which were dropped for budgetary reasons. With energy-conserving materials and controlled sun exposure, Crawford still hopes the home will be Energy Star rated.